Well, that can sound quite funny and unbelievable but you can now take place of Frodo, the hero hobbit in the movie Lord of the Rings. As you can see in the image editor on this page the king stands behind the hobbit and with your funny photos you can spend quite a time with your friends enjoying such pictures. You can be more interested in this if you are a college or school going boy. 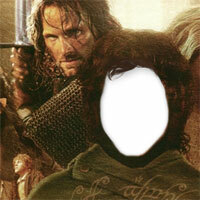 Become a superhero of your dreams, just use our Lord of the rings template online and share it online.